Toronto, Ontario--(Newsfile Corp. - November 8, 2018) - IAMGOLD Corporation (TSX: IMG) ("IAMGOLD" or the "Company") today provided an update from its ongoing 2018 exploration drilling program along the Saramacca - Brokolonko trend, located 25 kilometres southwest of its Rosebel Gold Mine ("RGM") in Suriname. 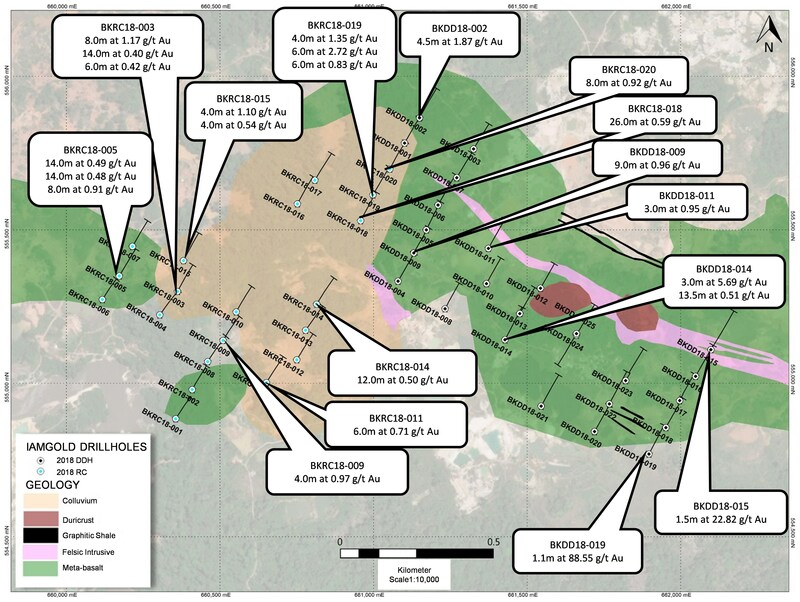 With the declaration of mineral reserves at the Saramacca deposit (see news release dated September 23, 2018) the Company has been conducting exploration drilling in selected target areas along the Saramacca - Brokolonko trend with the objective to discover additional zones of mineralization. 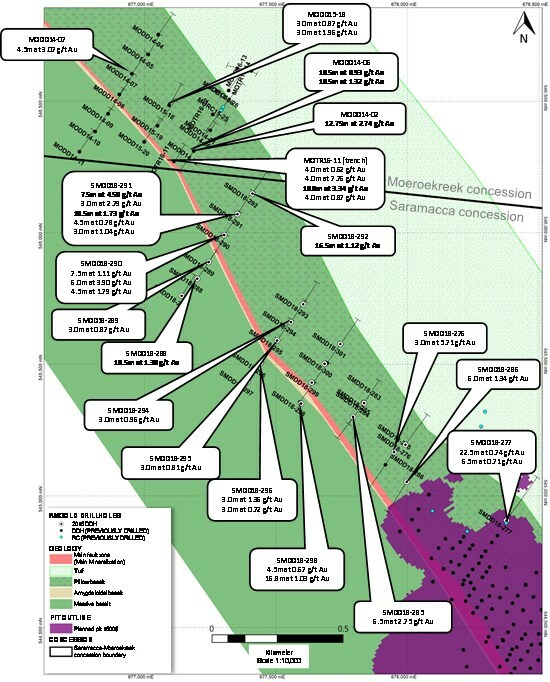 The Company is reporting results from 27 drill holes, totaling 4,643 metres, completed in 2018 to the northwest along strike of the Saramacca deposit, and results from relevant reconnaissance drilling and surface trenching carried out between 2014 and 2016 on the adjacent Sarafina-Moeroekreek concession. Reconnaissance drill holes and trenches reported herein consist of 16 holes, totaling 2,415 metres, and four trenches with a total length of 206 metres. Results from a further 45 drill holes, totaling 7,069 metres, completed in 2018 to test exploration targets on the Brokolonko concession are also disclosed. Assay intersections relating to this release are provided in Tables 1, 2 and 3. 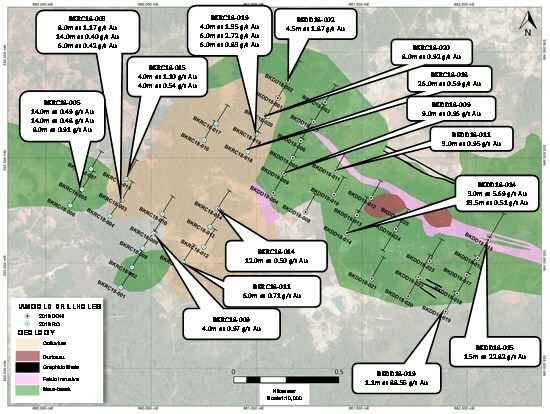 Mineralization representing a potential new zone has been intersected by wide spaced drilling approximately 400 metres northwest along strike of the Saramacca deposit extending for at least 1,200 metres of strike length to the northwest onto the adjacent Sarafina - Moeroekreek concession. Craig MacDougall, Senior Vice President, Exploration for IAMGOLD, stated, "While still early days, our ongoing exploration efforts targeting new areas along the Saramacca - Brokolonko trend are already delivering encouraging results and confirm the regional potential for further discoveries. These initial results suggest the presence of a potential new zone of mineralization along strike of the Saramacca deposit, and have also yielded the first indications of gold bearing structures on the highly prospective Brokolonko concession." Added Steve Letwin, IAMGOLD's President and CEO, "I can't begin to say how excited I am with the steady progress that's being made towards expanding resources at Saramacca. The continuation of positive results on the property, and now for the first time at Brokolonko, further validate our strategy to transform Rosebel." Exploration activities at the Saramacca Project culminated with the declaration of reserves in the third quarter 2018. As at September 23, 2018, Saramacca hosted estimated mineral reserves, on a 100% basis, comprising proven and probable reserves of 26.5 million tonnes, grading 1.8 g/t Au for 1.54 million ounces of contained gold. Also on a 100% basis, indicated resources (inclusive of reserves) were estimated at 27.9 million tonnes, grading 2.0 g/t Au for 1.76 million ounces of gold, and inferred resources, on a 100% basis, of 11.8 million tonnes, grading 0.7 g/t Au for 273,000 ounces of gold. (see news release dated September 23, 2018). An Environmental and Social Impact Study ("ESIA") to support permitting has been submitted to Surinamese environmental regulators, and ongoing technical studies at various levels of advancement, ranging from pre-feasibility to detailed engineering continue. Construction has been initiated for various elements of the Project. Firm orders have been placed for the acquisition of the mine haulage fleet, and the haul road between the Saramacca deposit and RGM is currently in the final phases of detailed engineering. On-going optimization studies including pit slope dewatering, slope design improvements and metallurgical testing to further optimize recoveries will continue in the fourth quarter 2018. The Saramacca Project is on track, with mining expected to commence in the second half of 2019. Exploration drilling will continue to evaluate the resource potential of the new zone located northwest along strike of the Saramacca deposit, as well as to evaluate the underground potential of high-grade mineralization previously intersected below the current Saramacca resource pit shell. Regionally, exploration activities are continuing to explore the highly prospective Saramacca - Brokolonko trend for additional zones of mineralization and to evaluate the resource potential of new discoveries as merited. The Saramacca - Brokolonko concessions are strategically located approximately 25 to 30 kilometres southwest of the RGM milling facility, which, together with the Sarafina - Moeroekreek concession, cover approximately 24 kilometres of the regional northwest trending Saramacca shear zone which hosts the Saramacca deposit and is believed to be an important deformation zone for the localization of gold mineralization. The concessions fall within the "UJV" area as defined in an Agreement with the Government of Suriname announced on April 15, 2013. The Agreement commits the parties to establishing a joint venture growth vehicle under which RGM would hold a 70% participating interest and the Government will acquire a 30% participating interest on a fully-paid basis. The "Qualified Person" responsible for the supervision of the preparation, verification and review of the technical information in this release is Caroline Laplante, P. Geo., Country Exploration Manager of the regional exploration team at the Rosebel Gold Mine in Suriname. She is considered a "Qualified Person" for the purposes of National Instrument 43-101 with respect to the technical information being reported on. The technical information has been included herein with the consent and prior review of the above noted Qualified Person. The information in this news release was reviewed and approved by Craig MacDougall, P.Geo., Senior Vice President, Exploration for IAMGOLD. Mr. MacDougall is a Qualified Person as defined by National Instrument 43-101. The sampling of, and assay data from, drill core and surface grab and trench chip samples are monitored through the implementation of a quality assurance - quality control (QA-QC) program designed to follow industry best practice. Drill core (HQ and NQ size) samples are selected by the IAMGOLD geologists and sawn in half with a diamond saw at the Rosebel mine site. Half of the core is retained at the site for reference purposes. Sample intervals may vary from half a metre to three meters depending on the geological observations with the majority of samples being one and a half metres in length. RC samples (5 5/8'' bit) are collected using a cone splitter, weighted at the rig with chip samples taken from the material for geological description and future reference. Samples are transported in sealed bags to FILAB in Paramaribo, Suriname, an independent commercial representative lab of ALS with an ISO 9001 (2015) certification. Samples are weighed and coarse crushed to <2.5 mm, and 350-450 grams is pulverized to 85% passing <100 μm. Samples are analyzed for gold using standard fire assay technique with a 50 gram (or 30 gram for 2014-2016 recon work in Moeroekreek) charge and an Atomic Absorption (AA) finish, and since phase II 2017 a gravimetric finish when grade exceeds 5 ppm. IAMGOLD inserts blanks and certified reference standard for quality control. All results stated in this announcement have passed IAMGOLD quality assurance and quality control protocols. This news release contains forward-looking statements. All statements, other than of historical fact, that address activities, events or developments that the Company believes, expects or anticipates will or may occur in the future (including, without limitation, statements regarding expected, estimated or planned gold production, cash costs, margin expansion, capital expenditures and exploration expenditures and statements regarding the estimation of mineral resources, exploration results, potential mineralization, potential mineral resources and mineral reserves) are forward-looking statements. Forward-looking statements are generally identifiable by use of the words "will", "should", "continue", "expect", "estimate", "believe", "plan" or "project" or the negative of these words or other variations on these words or comparable terminology. Forward-looking statements are subject to a number of risks and uncertainties, many of which are beyond the Company's ability to control or predict, that may cause the actual results of the Company to differ materially from those discussed in the forward-looking statements. Factors that could cause actual results or events to differ materially from current expectations include, among other things, without limitation, failure to meet expected, estimated or planned gold production, cash costs, margin expansion, capital expenditures and exploration expenditures and failure to establish estimated mineral resources, the possibility that future exploration results will not be consistent with the Company's expectations, changes in world gold markets and other risks disclosed in IAMGOLD's most recent Form 40-F/Annual Information Form on file with the United States Securities and Exchange Commission and Canadian provincial securities regulatory authorities. Any forward-looking statement speaks only as of the date on which it is made and, except as may be required by applicable securities laws, the Company disclaims any intent or obligation to update any forward-looking statement. Drill hole intercepts are calculated using a 0.30 g/t Au assay cut-off and 3m minimum length, with no assay capping. True widths are estimated from intersected geometries. from the 2014- 2016 Exploration Program on Sarafina - Moeroekreek Concession. The 2014-2016 drill hole and trench intercepts are uncapped with no minimal length applied. Table 3: Diamond and Reverse Circulation Drill Hole Assay Results from the 2018 Brokolonko Drilling Program. Drill hole intercepts are calculated using a 0.30 g/t Au assay cut-off and 3m minimum length. Intercepts with a value of ≥ 5g/t have been analyzed by gravimetric and included in the table. True widths are estimated from intersected geometries considering a 125/85 structure.